Yes, my chinese pistachio fell down. Reason? Heavy wind for one thing but also because when it was planted from a one gallon contanier 20 years ago, there were circling roots and I didn't do a good job of fixing that by cutting and tearing those roots before planting. 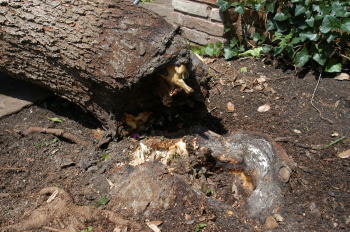 As you can see from these photos, the circling roots strangled the trunk and caused the rotting that weakened the tree. The air spade can be used to uncover root flares and expose girdling roots that are damaging to trees, but it can't reverse the damage done years ago. 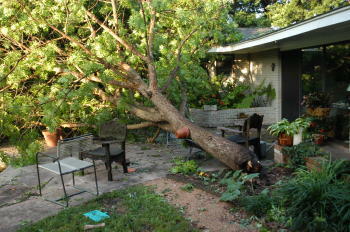 This case study clearly illustrates the importance of planting trees correctly. Correct planting includes the elimination of circling and girdling roots. 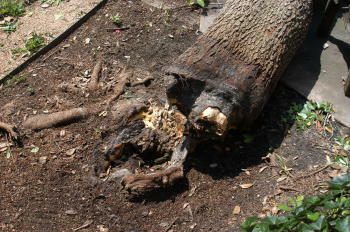 That can't be done unless the excess soil is removed from the top of the root ball prior to planting.